The next meeting of the Hyde Street Pier Model Shipwrights is this coming Saturday, June 18th. We’ll be meeting as usual aboard the ferryboat Eureka at 9:30am. Club topics that will be discussed will include our Annual Barbecue, which is taking place on Saturday, August 15th in lieu of our regular August meeting. 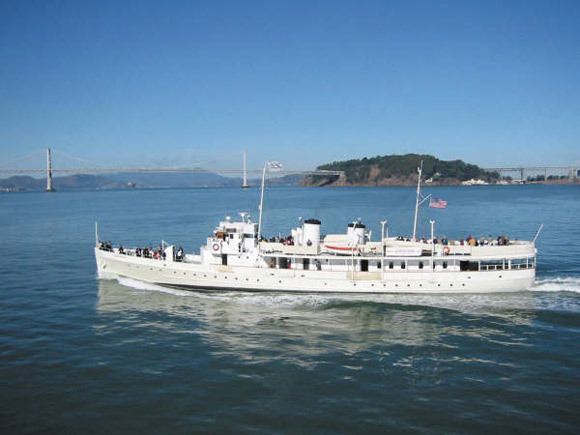 Also, we’ll be trying to get a final count and to nail down a specific date for our upcoming club cruise on board the former Presidential Yacht, U.S.S. Potomac. The plan is to get a group of 20 signed up for a 2 hour cruise on either August 8th or September 12th. Members need to chime in so we can get this nailed down! The Potomac is moored near Jack London Square in Oakland, CA. More info on the ship can be found at: usspotomac.org. This entry was posted in Club News, Hyde Street Pier and tagged HSPMS, Meeting, USS Potomac by catopower. Bookmark the permalink.